This review is for the first volume of Sword Art Online Alternative: Gun Gale Online. This is a spinoff series to Reki Kawahara’s popular Sword Art Online light novels. Gun Gale Online is written by Keiichi Sigsawa and features illustrations by Kohaku Kuroboshi. Volume 2 will release in English on September 18th, 2018. So far there are eight volumes in Japan. At any rate, SAO isn’t really my sort of thing, but I’m happy for all of you that enjoy it. I might get around to reading a volume of it one day, but first things first: the spinoff series written by Keiichi Sigsawa, the author famous for Kino’s Journey (a favorite of mine, that I’m always meaning to read more of). SAO Alternative: Gun Gale Online features new characters who have their own adventures in the world of virtual reality, specifically in the form of a shooting game titled Gun Gale Online. 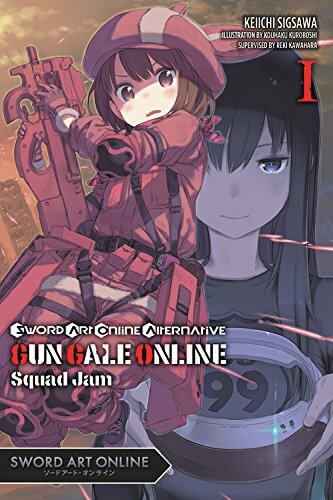 In volume 1, the lead characters Llenn and M enter a battle royale tournament to see if their team can survive ’til the end. It’s not a terribly conflict-driven story, since it’s literally just “Will Karen win the tournament?” But if you’re a SAO fan who could use a break from Kirito’s adventures and/or enjoy action-packed reads, this is worth giving a try. I felt the volume was pretty monotonous with it being almost 100% devoted to the gun battles, but I can acknowledge I’m not really the target audience for this one. It was at least clear to me that the author had a fun time writing it, and I imagine it can be a rollicking jaunt for interested readers as well.